We provide meaningful personal and team growth through fun and challenging learning exercises. The objectives of our activities could be as complex as resolving major issues or conflicts affecting productivity to simply getting the team together to have a fun time. Movers & Shakers help to optimize the productivity, effectiveness and overall happiness of your team. "Everything we do is fun, but everything we do you can learn something from"
Our corporate team building activities, motivational events and company motivation provide meaningful personal and team growth through fun and challenging learning exercises for outdoor team building activities and indoor team events. All Movers & Shakers programs are designed to be extremely diverse in nature, from team building activities based on a standard outcome modular designed activities to more specific organizational development teambuilding interventions. Diversity is essential to keep the delegates on their toes as well as to keep them stimulated by the team building ideas. Active participation by all is encouraged and there are numerous and diverse benefits and outcomes from every team building program. Movers & Shakers activities could be as complex as resolving major issues affecting productivity to simply getting the team together to have a fun time. Our outdoor team building activities and indoor teambuilding events range from half day agendas through to multi-day retreats. These specially designed team building games and game events should be shown somewhat more respect than a mere game. When it comes to team building games and game events, it’s not about who wins or loses, but what you learn along the way. Make corporate teambuilding all the more memorable. Let your team adventure out of their comfort zone and into another world. 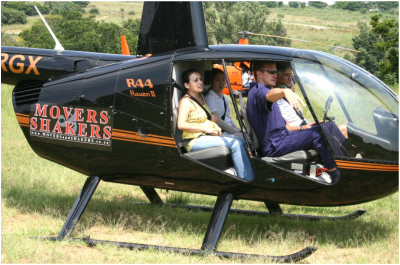 Movers & Shakers adventure team building activities and events have been cleverly designed not to be cost prohibitive. All of the agendas of our events are results-orientated to take your team to the next level in your corporate environment! We are able to assist you with the technical aspects of your conference or meeting from working on the company's vision and mission statement to carefully planning your corporate upliftment strategy. Soft skills are increasingly sought out by employers in addition to standard qualifications! Our Soft skills workshop includes business leader training, personality profiling, presentation skills & listening skills! Our Executive Leadership Coaching and business leader development assists in helping business leaders to understand and implement some of the principles of leadership that they have not yet mastered. Build up a successful sales team that forms the core of the organisation's sales techniques and practical selling skills and sales techniques! Corporate entertainment events must be fun, be experiential and create a culture & memory within the group. Movers & Shakers are focused on the initial needs of the company or department when planning your group’s entertaining team building programs. There is huge value in getting the whole extended team together, with spouses and children, and just getting shoulder-to-shoulder, having a good laugh, and being human together. We can provide enough activities to cater for all tastes and interests, and to satisfy even the greatest competitive characters. Poker Face is designed to provide a structured and organised approach to having some fun and playing hard. This Social event gives the team an advantageous insight into business interaction by delivering the unexpected and creating new realities through enhanced awareness of the market environment. A military simulation | Milsim that can be identical to the real thing! This military simulation is exciting and fun and will definitely refresh and inspire your delegates. Many different options of weapons and equipment are available ranging from fully automatic rifles, pistols and handguns, shotguns, sniper rifles, grenade launchers and even mounted machine guns. It is an excellent platform for team building and leadership but is also a fun game with a lot of team player interaction, with the adrenaline of a fast paced game. Airsoft HQ for information, combat training and military simulations. We supply the best in affordable & high quality Airsoft guns and supplies for your wargames. In the manner of "Raiders of the Lost Ark", Delegates are drawn into the world of archaeological adventure in this creative and bonding teambuilding event. Equipped with a guide, delegates work as teams of archaeologists in a race to learn the mystical ways of the Wehdehellawi (pronounced weh-de-hell-ar-wi) Tribe. New and more advanced ideas - Movers & Shakers continuously develop new and more advanced teambuilding ideas for our many repeat clients we have built relationships with over the years. Our goal is to provide such an unbelievable event, that you are forced to come back to us next year to take your team to the next level. All Movers & Shakers corporate team building activities and team events are all presented with an exciting scenario briefing, intelligently facilitated, and finally debriefed in a mature manner. Click here to view the Movers and Shakers website for the our diversity of Motivation - motivational Activities | Corporate team building activities & events | Business team building activities & entertainment | Outdoor team building activities and indoor teambuilding events | Corporate entertainment activities | Exciting adventure team building | Adventure events | Team building games | Fun corporate teambuilding games and company game events.